Moving structures can provide architects with exciting opportunities to overcome problems, optimise the use of space and push boundaries. However, their apparent complexity and hidden pitfalls mean that many great ideas for moving structures fail before they ever come to fruition. At Eadon Consulting we have worked on numerous moving structures and there are some basic rules to follow if architects want to get their moving designs off the ground. Some architectural problems can only be solved with a moving structure. Typical examples include bridges which open to let through shipping, stadium roofs which open and close depending on the weather and buildings which rotate to follow the sun. The developer of Richard Rogers’ Leadenhall Building in the City of London had a problem achieving the required emergency escape route without cluttering the new foyer. As engineers who are specialists in moving structures, we at Eadon Consulting worked with the contractor to design a Thunderbirds-style hatch, which is hidden within the floor but raises to open when the fire alarm is triggered. The innovative escape hatch is completely failsafe and even has a neat handrail that deploys with the hatch, meaning that the pop-up escape route is completely compliant with fire regulations, thereby validating the building for occupancy. The Falkirk Wheel in Scotland is another example of a moving structure which solves a challenging infrastructure problem. The flight of lock gates on the canal link between Glasgow and Edinburgh fell into disrepair in the 1930s, severing the waterway link between the two cities. A millennium project sought to reunite the two parts of the canal. The rotating boat lift takes the form of a Celtic-inspired double-headed axe and raises boats 24m into the air. Moving structures are generally heavy and therefore take a lot of energy to lift; however, the diametrically opposed water-filled caissons of the Falkirk Wheel boat lift are counterbalanced, meaning that the energy required to move 1,000 tonnes of water is roughly the same as boiling eight kettles. In New Zealand’s North Island an opening bridge was required over the Lower Hatea River. The highways authority could fund the function of the bridge, however, the client also required the bridge to reflect local Maori tradition. 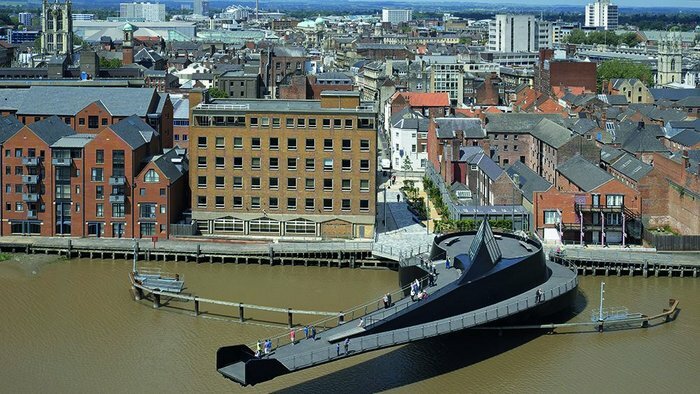 Eadon Consulting worked with Knight Architects to jointly solve the architectural and engineering challenges, with the traditional form of a Maori fish hook inspiring a rolling bascule bridge. The tip of the hook acts as a large counterweight and a pair of hydraulic rams push the deck of the bridge upwards, forcing it to roll upwards and backwards on the curve of the hook. By integrating the specialist moving structure engineers from the concept stage, it was possible to come up with an elegantly simple design that directly incorporated Maori themes, providing reliability and value to the client and creating a much-loved landmark structure. Counterbalances on the Falkirk Wheel mean the heavy lifting can be done with the same energy as boiling eight kettles. As you can see from these examples, moving structures are often one-offs and can be a daunting prospect for developers or architects to take on. The first step in a successful project is to confirm if the structure really does need to move. If moving the structure is a sensible option, then it is vital to develop some sound initial concepts; the simpler the concept then the cheaper and more reliable it is likely to be. Basic physics offers a great starting point to estimate the forces, power and energy required to make the thing move – as a simple rule of thumb, if the power is equal to tens of kettles it is probably OK; if you are talking about thousands of kettles then you may need to think again! A specialist mechanical consultant will be able to quickly assist in developing a reliable outline concept which meets the design life and incorporates maintenance and safety considerations. The next step may be to develop a 'functional specification’, which will clearly define the interactions and interdependencies between the structural elements, the mechanical systems (such as hydraulic rams, gears and motors) and the control system (sensors, human interface and computer systems). It is common for specialist fabricators and equipment suppliers to be consulted throughout the design process. The specialist mechanical consultant may then produce an ‘exemplar’ design for the overall system, with the fabricators and suppliers conducting their own detailed design in accordance with the functional specification. Moving structures are machines within their own right, and are therefore subject to some additional regulations which do not normally apply to buildings. The Machinery Directive applies to all powered machines and lays down the procedures required to demonstrate that the new machine is safe. The outcome of this procedure is a CE mark certification. The other main regulation, the Provision and Use of Work Equipment Regulations (PUWER), sets out the responsibilities incumbent upon the owner, as well as the certification procedure to demonstrate that the system is safe for use. To avoid delay or frustration during the commissioning of the moving structure, it is a good idea to start the audit trail for regulatory compliance during the design phase. Knight Architects’ Lower Hatea Bridge concept sketch. Buildings and structures are designed to ensure that they are simultaneously strong enough to withstand the maximum loads they will ever encounter (the Ultimate Limit State) and that their movements and deflections remain acceptable to the users (the Serviceability Limit State). For very tall buildings and for long-span floors the requirement to limit deflection is usually the driving factor on the size and weight of structural members, meaning that much of the structure is there purely to make it stiff, even though a much more lightweight structure could be completely safe. Integrating mechanical systems into structures introduces the exciting possibility of creating lightweight reactive buildings that would work in much the way that the muscles in your arm react to keep your hand still when you are given a cup of tea, or your stomach muscles tense to keep your back straight when you put on a rucksack. 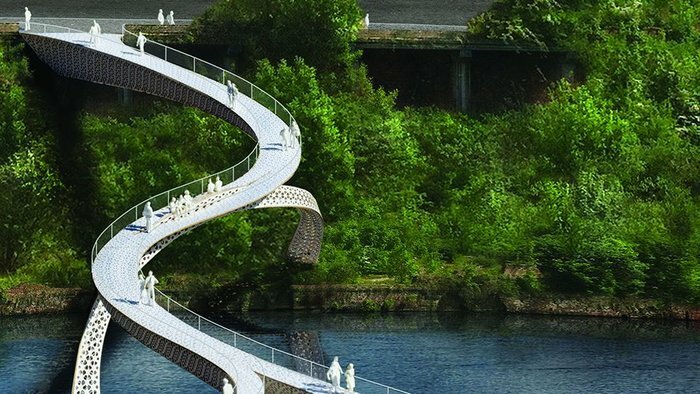 The new opening cycle bridge in Copenhagen – created with a team involving WilkinsonEyre and BuroHappold – uses a simple hydraulic system to link the tips of the opposing spans as the bridge shuts. The pairs of cylinders lock the two halves together and then ‘push and pull’, providing compression into the top of the bridge beam and tension into the bottom, forcing the bridge to behave as one continuous beam rather than two cantilevers. 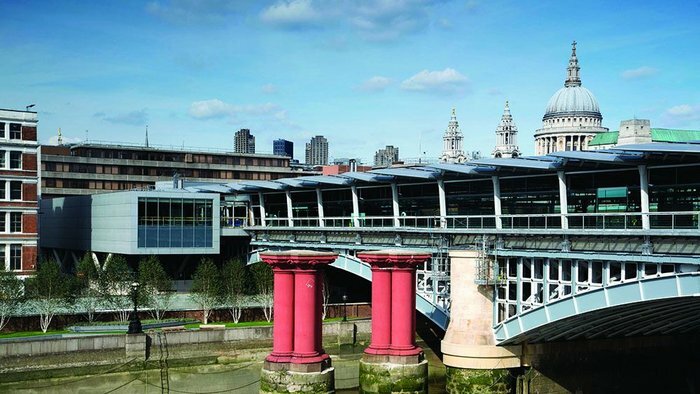 This innovative hydraulic lock approximately halves the required structural depth of the bridge beams, allowing the creation of an elegant slender bridge. This innovative connection crucially also allows the steel bridge to expand and contract at the joint to accommodate thermal expansion without damaging its rotating bearings. The Lower Hatea Bridge in New Zealand moves by counterweight and hydraulic rams. Keep it simple. Avoid any unnecessary complexity which will increase cost and project risk. Develop a sound concept. Use basic physics to ensure that the forces and energy involved are realistic. Engage specialist advice early. Speak to a specialist structural/mechanical engineering consultancy, which will help develop viable concepts and produce a specification to define the interaction of the structural, mechanical and control systems. Think safety and maintenance from the outset. Remember you are designing a machine. Seek specialist advice to ensure you comply with the Machineries Directive and Provision and Use of Work Equipment Regulations. Don’t be afraid to try something amazing!